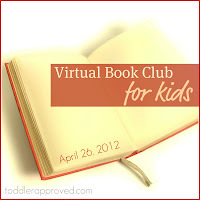 Danielle at Mommy and Me Book Club is co-hosting April's Virtual Book Club for Kids with us and she chose The Carrot Seed by Ruth Krauss as this month's book. I LOVED it and so did the kids in our book club. I have a few Carrot Seed themed activities to share with you today and a few other ones that I'll include in another post. We had seven little friends over on Monday for our Carrot Seed Mommy and Me Book Club and we had way too much fun. 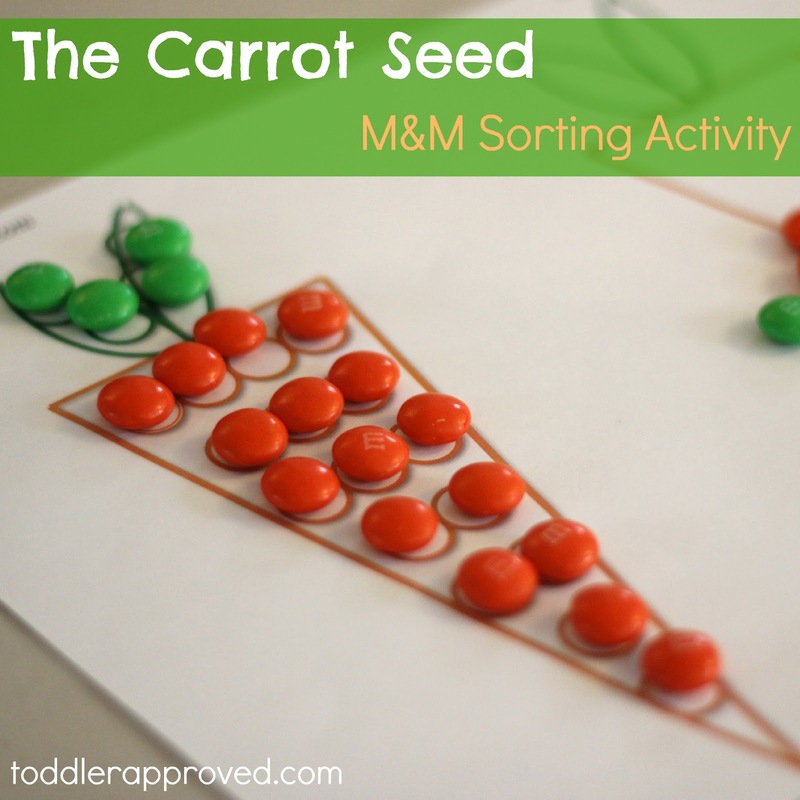 One that was a hit was The Carrot Seed M&M sorting activity. 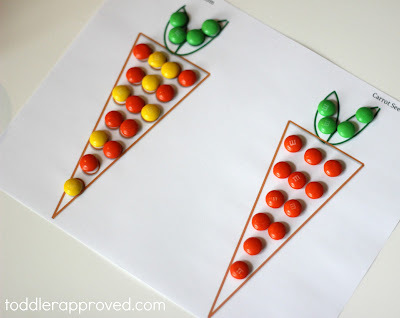 Each kid got a carrot M&M sorting template and had fun sorting through different colored M&Ms to create their carrots. They used green, orange, and yellow M&Ms to design their carrots however they wanted. One side of the template has circles and the other one is blank so your child can put the M&Ms however they want. One matching activity idea could be to have your child create a design on the template using colored pencils or crayons and then sort through the M&Ms to match them to the design on the template. My co-blogger EJ is the M&M printable wizard, so this is just my simple attempt at trying my own. What kid doesn't love an activity with M&Ms? You could also cut up baby carrots and use little carrot pieces or cereal for this activity if you want to make it more healthy. I got this next activity from PreKinders. 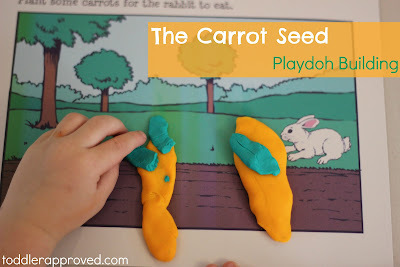 I printed off the toddler playdoh mats and the kids explored using the playdoh to plant their carrot garden as our gathering activity when Mommy & Me Book Club started. I laid out a large plastic tablecloth on our kitchen floor for a playdoh picnic and had lots of playdoh for the kids to use as they explored. It was fun to see the different things they created. 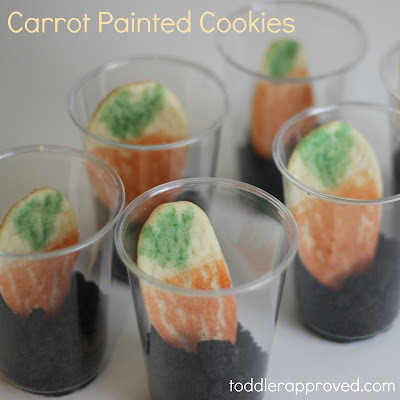 Lastly, I created carrot painted cookies as a book club snack with my son. You can read the directions here. Next time I will have the whole group paint them since they ended up being super easy! 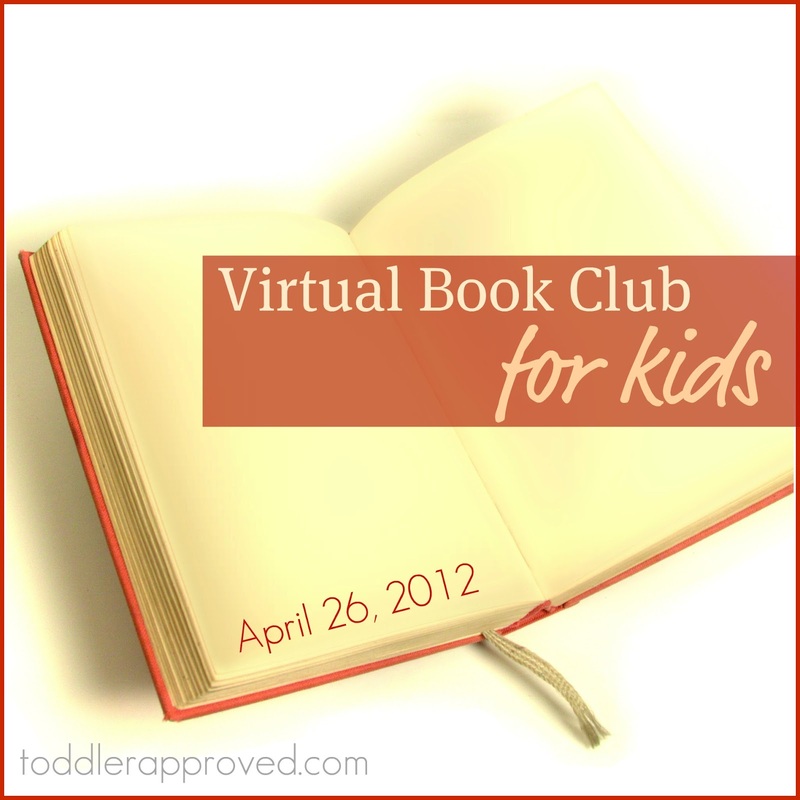 Did you participate in our Virtual Book Club for Kids this month? What was your child's favorite part of the book? What did you create? My son thought it was sooo funny that the carrot was so big at the end! He also thought it was funny every time people said, "it won't come up!" When we got to the parts in the book that talked about weeding and sprinkling water, the kids pretended to weed their gardens and sprinkle water all over. If you participated in book club this month and have a Carrot Seed blog post to share with us, please link it up in the linky below! Please make sure to only link up Carrot Seed related posts. If you have more than one to share, you are welcome to share them, but limit your links to two. Blog posts should share about your book club experience and a learning activity, craft, or related project you did! I can't wait to see what you link up! If your post is not Carrot Seed themed or you link more than two posts, I will unfortunately have to delete your extra/irrelevant posts! I will be adding the posts below to our Virtual Book Club Pinterest Board along with sharing them over on Toddler Approved's Facebook page. I highly recommend you visit other blogs participating in the link up, leave a comment, and share the fabulous posts you discover too! If you would like to participate in the blog hop and don't already have the blog hop linky code to put at the bottom of your blog, email me at toddlerapproved (at) gmail (dot) com and I will send you the HTML. I love the carrot cookies! So cute! And the play dough mats! And the M&Ms. Such awesome activities. Can't see the rest of the activities! Your carrot counting activity looks like lots of fun!